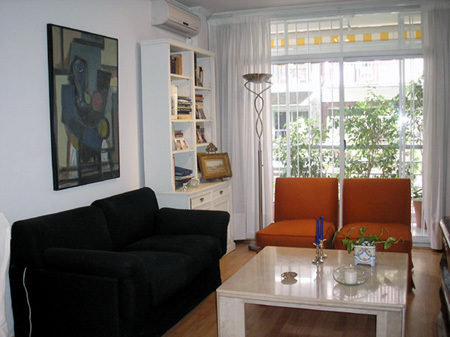 This very nice and bright one bedroom apartmen is situated in a great location in Recoleta, just 200mts from the Recoleta Village where visitors will find several shops, restaurants and cinemas. It is equipped with Cable TV, air conditioning. The living room has sofa and armchairs, the bedroom has a double bed bed. Fully equipped kitchen and the bathroom is complete with bathtub and shower. Brand new building, 24hs security ( doorman), comunal sauna, launderette, solarium and swimming pool for summer season. Balcony, confortable sofa, A/A, Heating System, Cable TV, kitchen equipped with dishes, oven, refrigerator, kitchenware. Linens and towels. Cleaning service once a week. Laundry, solarium. Very good buildig with amenities. Included: Electricity, gas, water, Internet, telephone, city taxes and building fees are paid by the owner.